MIAMI — Sea Ray launched a fleet of luxury motoryachts Friday at the Yacht & Brokerage Show with the introduction of the L650 Fly, a two-bridge vessel powered with twin Caterpillar diesels mated to a joystick system by Glendinning. The large flybridge serves not only as a place to pilot the vessel, but also as a social gathering spot for passengers — at anchor or while under way, said Ron Berman, vice president of product development and engineering for Brunswick, Sea Ray’s parent company. 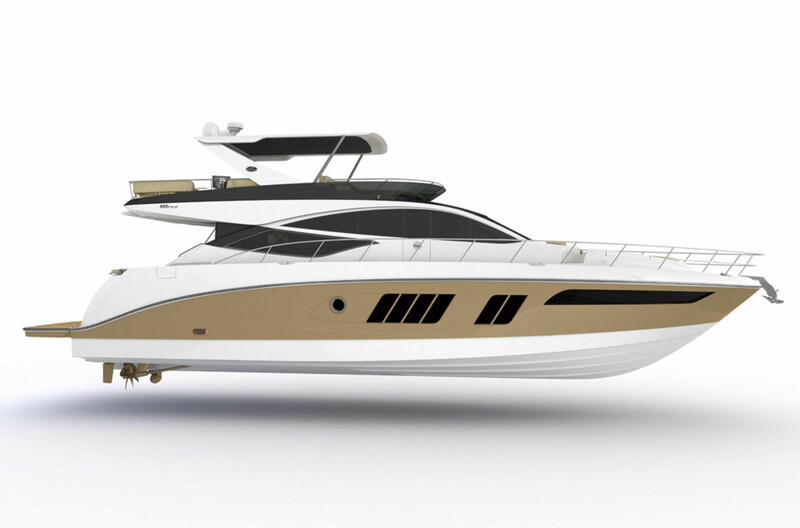 Sea Ray will build its L-Class yachts with a “higher grade of everything,” said Berman, such as quartz galley countertops, innovative drawer latches and high-end hardware and fabrics. Look for three more L-Class yachts at the Fort Lauderdale International Boat Show — the L650 Express and the L580 Fly and Express, Berman said. The L650 Fly is available with a Seakeeper gyro stabilization system. The flybridge includes multiple seating areas and a “sunpad playpen.” She houses a full-beam master suite and two additional staterooms. A galley-up design melds seamlessly with a large living area full of natural light. Sea Ray will introduce 11 more models in 2014, Berman said. It introduced eight models in 2013. The twin 1,136-hp Cats will deliver speeds in excess of 30 knots, according to the builder.